We talked to a Florida neighbor on the phone the other night and he commented that Michiganders were coming to Florida this summer to cool off. That isn't far from the truth. This has been a record-breaking July with a week of temps in the low 90s and night temps in the high 70s. Several days were record breakers. It was the hottest July since they began keeping records. Even the rain amount was high, but it came all in 3 storms. The extreme weather stressed my garden and it was too hot for me to work on it. I watered a few times but had to be careful of water bills with keeping the pool filled, too. This was in late July but with the cooler weather in August the weeds have just taken over. I have been working a little on bringing back the rose garden. I am hoping the lady who worked with me last year on the garden will be here to help me again before fall. She has indicated that she will be here once the weather cools down a little. Meanwhile, we are enjoying the pool and air conditioning. A pool keeps the youngsters amused for hours!!! Do I like this photo? 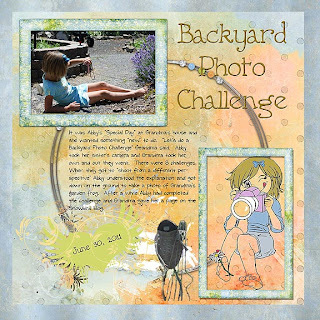 In the Digital Photography School newsletter I read about a challenge to shoot some particular photos right in your own backyard. There were 8 suggested challenge photos to take. That same day my younger granddaughter was spending the day with me. Her sister is 8 and has her own Canon camera, which just happened to be on my desk. I showed the 5 year old a few details and out into the backyard we went. Here are some of her photos and mine of her taking those photos. This was the first thing that caught her eye. 2. Photograph the light. She liked the way the light came through the lattice roof. If you look hard in the door wall glass you can see the little photographer. 3. Shoot from a different perspective. She got right down on the ground to "shoot" this frog once I explained "perspective". A photographer doesn't care if she has to get down on the ground. 4. What is growing? This is her herb garden and it is just starting to grow. The seeds came from a Christmas gift set. 5. Where is your favorite place? Yes...that is my favorite place in the backyard. 6. Find lines and shapes. She found this circle...just ignore the Gramma-razzi in the background.